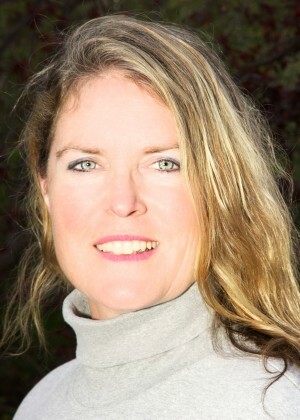 Alisa Clickenger is a regular contributor to MPN even though she quit the corporate world in 2006. Having fallen in love with the roads less traveled, she’s ridden both the Trans America Trail and the Continental Divide Ride, all over Europe, the Americas, up to Alaska, most recently in India, Israel and Africa. Alisa's goal is to support and empower other riders, particularly women, to achieve their two-wheeled dreams. Her blog is www.MotoAdventureGal.com. One part motorcycle dealership, one part vintage motorcycle museum and one part online/mail order new, classic, vintage and used motorcycle parts store, Bob’s BMW located in Jessup, Maryland, adds up to a 100 percent successful dealership. Store owner Bob Henig started out modestly by selling used BMW motorcycle parts from his garage in 1981 (the days before e-anything). Now Bob’s BMW is one of the largest, most respected BMW dealerships in North America with nearly $10 million in annual sales. Bob’s BMW has won numerous awards for overall excellence, merchandising, customer satisfaction and community service. The dealership’s recipe for success is Bob’s careful combination of sales and service of new and used BMW motorcycles, complete refurbishing and restorations on any year BMW built since 1950, great service and a passion for the BMW brand that Henig has parlayed into a world-class collection of BMW motorcycles and paraphernalia. Henig may do several things within his dealership that are out of the ordinary, such as operating a thriving mail order business at his location and assigning every customer a singular mechanic with whom he builds a one-on-one relationship, yet each is incredibly well thought out – and successful. Henig treats the trade-in process like science and has developed a winning formula to maximize profits and create a win-win situation for his customers. Henig has come up with a proprietary formula that he’s shared with other dealers in his 20-Group, and with 15 percent of the dealership’s revenue derived from the sale of used bikes, people listen. Other outside-the-box thinking includes Henig’s directive that every department in the dealership be fiscally responsible, ensuring that each department is in the black and not relying on another department’s success to carry them. “I’ve always believed that dealerships should be fun. They should be a good place to get information,” says Henig. The dealership’s coffee area walls are covered with interesting and up-to-date motorcycling articles from newspapers and industry magazines. The same is true in the men’s room. There is a waiting lounge in the service department, which Henig has declared as a “no sell zone.” It is purely for customers to relax in and take some down time while their bike is being serviced. “You cannot be selling to the customer all the time,” says Henig. Bob’s BMW escapes the seasonal “hire and fire” cycle by focusing on the service department’s winter work business, incentives on PG&A sales and tightening their belts a bit. They’ve developed programs like the Polar Bear Challenge, which encourages customers to put on the miles even in the chilly season. They also encourage and assist customers with restorations and rebuilds during the winter months. The proof is in the people: Lex O’Brien, Bob’s BMW e-commerce content manager, has been with the dealership for 25 years. Every employee gets full health benefits, 100 percent company paid. Rain, shine or snow, every Saturday Bob’s BMW offers “while you wait” repair service. Customers line up on a first-come, first-serve basis, some so eager that they line up two hours before the dealership opens. Seeing this kind of customer enthusiasm led to the dealership setting up a coffee service table outside the night before. When the first customers arrive all they have to do is press the power button for their morning cup of joe. Morning entertainment comes in the form of other customers in line until the shop opens for business. In warmer weather there’s even a self-service bike wash station complete with an amusing vintage illustration. For efficiency’s sake, the dealership also puts out service cards that customers fill out while waiting their turn. On these cards customers record billing details, motorcycle information and what type of service is required. Customers that arrive on Saturdays with more intense service needs are sometimes asked to wait until the “quickies” are served. Handled well and with clear communication, this has never been a problem for the dealership. Their service department is then closed on Sunday and Monday, which the dealership has found actually improves efficiency and customer communication. 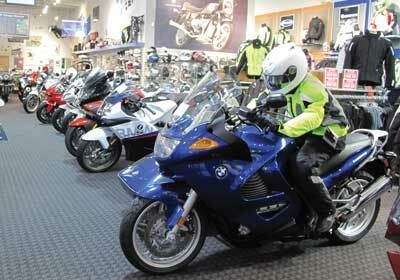 Bob’s officially opened as a BMW motorcycle dealership in 1990 and they’ve always had BMW items on display. 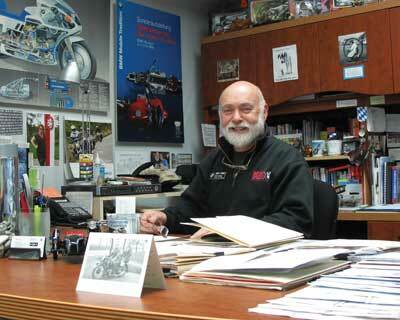 Henig is an avid collector of BMW motorcycles, memorabilia and wall art. Out of more than 75 motorcycles in the public collection, only three have any type of modification or minor restoration. Because of Bob’s penchant for unrestored, original motorcycles, many of his display motorcycles serve as benchmarks for customers doing their own restorations. “We offer the museum up as a tool for our customers. Everybody’s idea of what a restoration is will be different. These [vintage]motorcycles we have on display serve as a benchmark for how the machines were when they came off the assembly line,” says Henig. There are currently around 75 bikes and 5 sidecars on display between what’s on the dealership floor and their space across the street, including an original, unrestored 1925 R32, which was BMW’s first production model. Bob’s hosts a variety of evening programs such as tech sessions, informational seminars and presentations from world travelers. The dealership maintains a Facebook page that connects riders with local rides. It also hosts hospitality days at track days as well as CCS and ASRA Motorcycle Races. The dealership has partnered with the Howard County Arts Council for a “Ride the Road to Art” program that got a larger number of customers riding and exploring real art installations within their local community. In the fall, the dealership puts on an open house and annual swap meet. Closest to Henig’s heart is the annual Baltimore/Washington Ride for Kids. 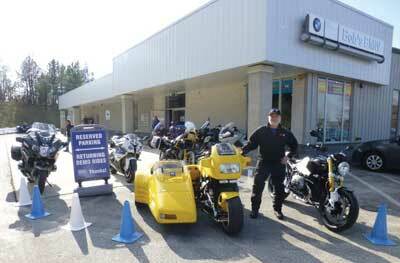 Bob’s BMW has been helping the Pediatric Brain Tumor Foundation raise money for over 20 years now, Henig himself bringing a high performance sidecar rig and providing rides to some of these special kids. “A lot of what we’ve done here has been shaped by the needs and wants of our customers,” says Henig, who now wants to build a retail complex of associated and complementary businesses that are not all owned by the dealership. Sounds like Bob’s BMW might just dominate the retail scene in the Washington, DC metro area, which would be no small feat. Then again, that might not be such a bad thing coming from a company whose owner gets teary-eyed when he talks about his practiced ability to keep a wig on a small child while helping them don and doff a motorcycle helmet.